The making of the New Best Upgraded / Improved Auto Switching 7800 Power supply. Best knew that late 2016 that sometime in 2017 we would finally run / sell out (happened mid. December 2017) of the pallet of New Atari 7800 US Power Supplies we got out of the local Sunnyvale Atari warehouses over 14 to 15+ years ago. Early May 2017 Best started to search for a New Power Supply manufacture. As we have always done for the 35 years in the Atari Business with all of the New and Upgraded Atari products we have made, we know we could make a much better Enhanced / Upgraded / State of the art version of the Atari 7800 power supply and fix the 25+ years of known problems on the stock Atari made different world wide 7800 Power Supplies. Atari had used about 5 to 7+ world wide different Power Supply Manufactures to make the US / 60 Hz 110V and PAL 220/240 50 Hz Atari 7800 Power supplies over the production run of the Atari 7800 consoles. Although completely different Power Supply manufactures made the different 8 to 10+ versions of the world wide used Atari 7800 Power Supplies of that era but all of them have suffered from the same type of known problems / failures over the last 25+ years. · The thin twin wires that go into the Power supply body strain relief and go into the back end of the custom made 2 pin 7800 power connector strain relief with its blue tip, always start to fray (black extruded plastic body / coating over the two wires opens up and exposes the copper wires) open. If not noticed, in extreme cases, the two copper wires would make contact together and blew the internal fuse on the step down transformer or internal PCB board, short out the bridge rectifier diodes or short out the transformer windings inside 7800 Power supply body. In some cases the copper wires inside the wire outer jacket next to the in strain relief, would break internally, but show no damage on the outside of the twin wire outer extruded black jacket. 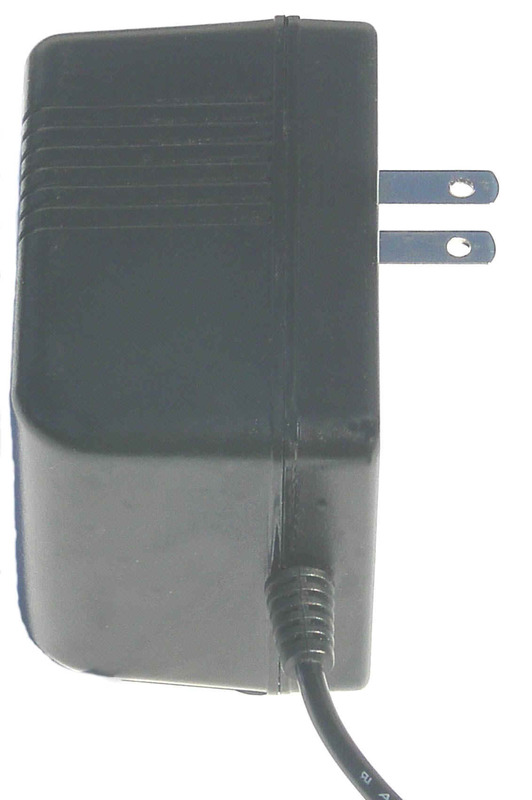 The outside of the Atari 7800 Power supply case would get warm to hot but there would be no out voltage at the Atari 7800 Power supply blue custom connector end. See pictures below. When we were in the different Sunnyvale Atari warehouses clearing them out, we saw boxes and boxes of hundreds and hundreds of defective / bad returned Atari 7800 power supplies with this frayed wire problem. Left picture is of a stock Atari made 7800 power supply. Right picture is a close up view of the same Atari 7800 Power supply. Notice the two exposed copper wires next to the Power supply cord molded on strain relief. 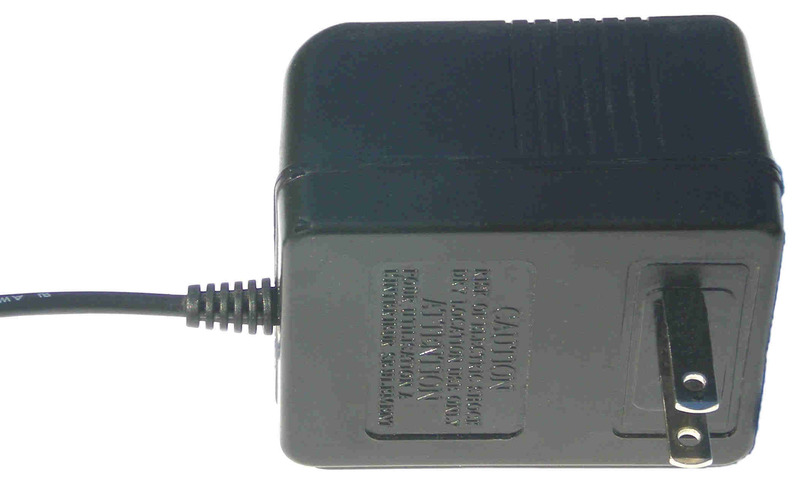 One of the other 5 to 7+ Atari Power Supply manufactures version of the Atari 7800 Power supply with the same type of twin cable damage, as the cable it goes into the molded on strain relief. In this case the molded / extruded together twin wires, have split apart and again the copper wire is exposed on one of the wire conductors. · Ever find / buy an Atari 7800 console, only to find the custom made Atari right angle 2 pin power connector is missing? It is missing because somebody removed it, to replace a melted / damaged one on a different 7800 console. In some bad cases we have seen Atari 7800 Right angle power receptacles that have heated up so high, that the solder around the two connector pins in the 7800 mating power receptacle, flowed out of the 2 solder joints and ended up on the bottom 7800 bottom metal RF shield and the 7800 stopped working because no power was getting to the 7800 motherboard. · What causes this over heating 7800 Power Supply receptacle problem, is the two small fork blades inside the end of the blue power supply connector tip, start to spread apart if the installed power cable is flexed up or down or side to side (physical movement of the 7800 console itself during game play) and inserted and removed from 7800 console right angle male connector over years and years of setting up the 7800 console for play. When this does happen, the fork blades inside of the 7800 blue female power connector do not make proper contact with the 2 mating male pins in right angle Atari 7800 motherboard PCB custom made female power in receptacle connector. The 2 fork blades (with there 2 small contact points top and bottom on each mating male pin) and 7800 right angle power receptacle Male pins start to heat up / arc / short internally, out of your view (this also puts an extra stress on the 7800 internal power supply components, shorting their useable life cycle), which makes the steel fork blades lose their tension, casing the fork blades top open up even more. You can bend back the opened up fork blades back to the normal position, but since the fork blades inside contacts surfaces have been arced, pitted (causing contact resistance) and they have been heated up and slowly cooled down over and over (when the 7800 console is turned off and on over many years of use) the fork blade steel is slowly annealed (softened) and loses its tension, the fork blades opening up problem will only happen faster. Since you can not see what is happening inside the 7800 power receptacle when you use your Atari 7800 console and the average 7800 owner does not know about the 7800 Power supply blade connector problem. They just keep going thru a lot of Atari 7800 Power supplies over and over. 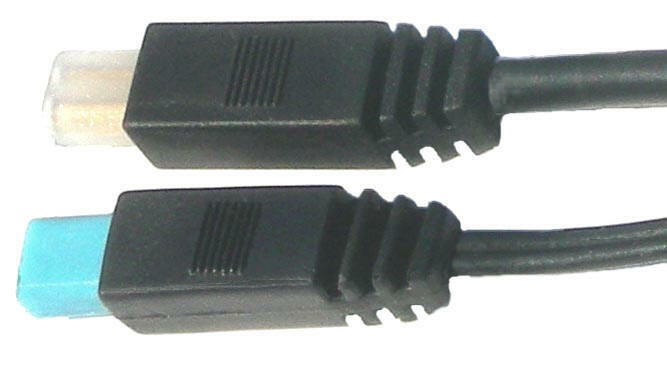 Best 7800 console Tech Tip: Before you install your new Best Upgraded / Improved 7800 on your 7800 console, you should 1st inspect your 7800 right angle power connector two small diameter male pins for burning, arching and damage on the outsides of the two pins. If they are damaged, try cleaning up the surface damage on the two pins, by taking a thin strip of some very fine sand paper and rolling it into a very small tube. Then insert the small tube of sandpaper over / around each pin and try to sand off the round pin surface damage. If that does not work, try cleaning the round pin surface damage with a small file or small Exacto knife blade edge. If do find a lot of damage on the Atari 7800 R/A connector pins, you should take apart your 7800 console down to the motherboard. It would be a good idea to touch up the 7800 Power connector soldered in two pins on the solder side of the 7800 PCB under the R/A Power connector body. A lot of the time, the two 7800 Power connector internal pins have heated so hot (because of arching and burning on those pins), that the solder around those two pins has flowed out of the 2 solder joints and dripped on to the 7800 bottom RF shield. · Another 7800 Power connector failure, the 2 right angle pins within the 7800 console power connector have heated up to the point, that enough solder has flowed out of the 2 pin 7800 PCB solder joints onto the bottom 7800 RF shield, that the pins thru the PCB board plated thru holes start to arch / heat up internally within the thickness of the 7800 PCB causing more solder lose. So you should inspect your Atari 7800 console PCB board Power supply 2 pin connector for the above problems before you use a new Best Upgraded 7800 power supply on your 7800 console. Another Best 7800 Power connector Tech Tip: There are two thin black plastic arms / legs / locking latches on either side of the 7800 R/A power connector body that lock the 7800 connector black body to the 7800 Motherboard. Many times the ends / bottom of these legs snap in locking latches, break off or simply bend because of the excess heat coming off the sides of the failing 7800 Power connector and allow the 7800 connector angle up / bend up off the 7800 motherboard. After you inspect / touch up the solder joints on the 7800 Power jack, it is a good idea to put some soft Hot melt glue on the right and left side sides of the 7800 power jack (locking it to the top side of the 7800 motherboard) so it will not shift left to right on the top side of the 7800 motherboard. Next on the bottom side of the 7800 PCB motherboard under the R/A Power Jack, put some soft hot melt glue into the right and left locking latch holes, locking the locking latch arms into the 7800 PCB. 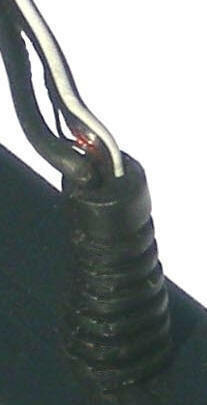 Close up view of the end of the Atari stock 7800 Custom 2 pin / fork blade power connector. Although the two female fork inside metal blades connectors look wide, the inside fork blade metal contact surfaces are flat and only contact the mating 7800 Right Angle Male receptacle round connector pins on two small top and bottom contact points. Best spent about two months sorting thru different Power Supply manufactures who contacted us. We finally sorted them down to 12 to 14 different Power Supply Manufactures and then finally decided on one that could meet our new Atari 7800 Power Supply requirements. We sent our new Power Supply vendor 4 to 5 different manufactures versions of the old Atari 7800 Power supplies and one of the custom made 7800 unique right angle power connectors for them to study and take apart. A few months of back and forth, prints, spec’s and pictures sent and reviewed and rejected. Mid September 2017 we were making progress to the point we were talking about paying for a 1st article sample of the new Enhanced / Upgraded universal Atari 7800 Power supply. 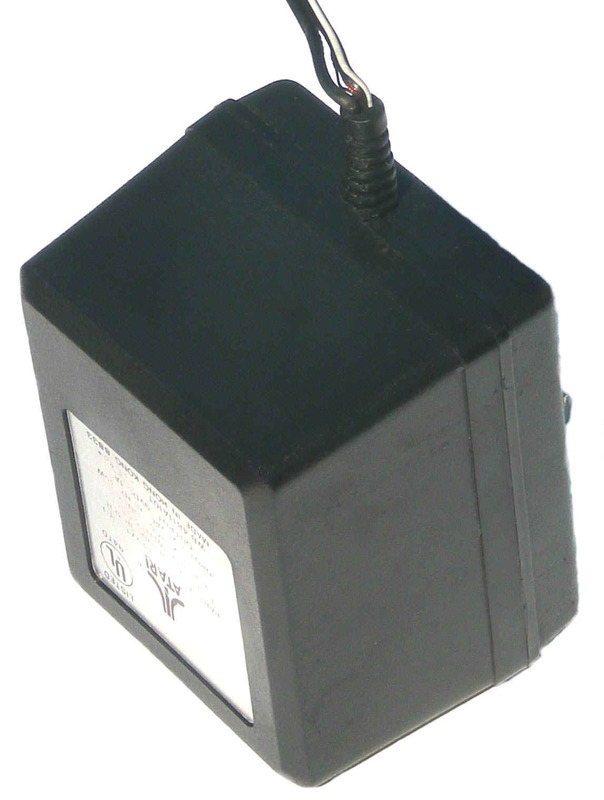 Best sent a payment to our new Power supply Manufacture for a 1st article sample plus shipping costs to the US for it. The 1st week of October Best received the 1st Article sample of the 7800 Power Supply. Right off we spotted some problems on the 1st article sample 7800 Power Supply. We sent a Receiving Inspection report back to our Power supply manufacture with required corrections on the new Best 7800 Power supply. Tracy C. of NC Tracy ordered one of the New just released (after 11 months work) Best Upgraded / Enhanced Auto switching Atari 7800 Power supplies, that cures the known stock Atari 7800 power supply design problems that cause them to all fail early. "The power supply arrived today safe, and the 7800 works beautifully. Thank you!" Best knew the total existing worldwide supply of New replacement (110V and 220/240V) Atari made 7800 Power supplies was running out. So we made the decision to make the next generation Upgraded / Enhanced Atari 7800 Power supply, an auto-switching model. There are two basic versions Power Supplies made now. The older fixed input voltage power supply (like the old US / Euro 7800 Power supplies) with the very heavy and large internal transformer and bridge-rectified output. Most of the new State of the Art Power supplies made now (can handle / auto switch input voltages from 110V to 240V and auto switch between 60 Hz and 50 Hz) are the Auto Switching power supplies with its smaller lighter internal construction. Just about every Smart Phone, IPAD, Tablet, Laptop and current phone / powered device you currently own is supplied (check the labels on those power supplies you own) with the external auto switching smaller / lighter type of power supply. Can you image lugging around a standard fixed input voltage power supply the size of old Atari 7800 Power supply for your smart phone / tablet and other portable electronics items you own? · A New feature new Best replaced the old stock Atari 7800 Power supply steel fork blade type problem connectors (with its 2 small point contacts on each mating connecting male pin) with two Gold plated split brass metal tube connectors with their increased mating male pin contact surface area. These new Gold plated split brass tube connectors are electrically rated to handle 5 times the normal 7800 Power supply output voltage / amps. Because of this brand New type of 7800 Power supply female tube connector design, this meant that Best had to make / pay for a brand new Injection mold ($$$) to house the new custom made 7800 Power supply custom female tube connectors and outer black housing / strain relief. The new Gold plated brass metal tube contacts / clamps on the mating 7800 motherboard R/A female connector male pin with around 350 degrees of metal to metal contact (on the 1st article sample 7800 Power supply). When the final approved Best 7800 Power supplies were received, our Power Supplier manufacture had upgraded the split tube connectors so they now clamp onto the mating 7800 male power supply connector pin 360 degrees of clamping force (no visual split in the tube length or visual split in the opening tube input hole using the naked eye to view). When you push on the new Best 7800 tube connector body into the 7800 mating right angle Power Jack, it takes more effort / force because of the increased clamping force of the duel Gold plated tube connectors, compared to the stock Atari made 7800 Power supply with its fork blade connectors with their limited 2 point contact surface area. This also means that there is less chances the 7800 power supply cable will be pulled out of the 7800 back power jack right angle connector by accident or glitch any 7800 game in play, because of a split second loss of power (like accidentally bumping / moving the 7800 console) into the 7800 console. This happens a lot on the old stock Atari 7800 Power supplies that have a lot of use on them / opened up fork connector blades. On October 12, 2017 Best received the 1st article sample of the new Atari 7800 Power Supply. The above picture is a close up view of the Prototype New Best 7800 power connector end with the New Gold plated tube connectors. If you do a close up look at the Gold tube opening hole 12 noon location, you can see a very slight gap / opening length slot in the tube. On the final version Best 7800 Power supply connector tube contact, this small gap has disappeared for a full 360 degree of metal to metal contact. One of the problems Best spotted on this 1st Article sample, was there was a little bit of mold flash (a little thin semi circular tab of injected molded plastic, which was removed for this close up picture) around the right metal tube connector bottom tube opening. Although the New 1st Article 7800 connector tested / worked good with this minor mold flash attached. Best sent a 1st Article receiving report back to our new Power supply vendors saying this problem is to be Corrected and will not be accepted on the full production run of this new 7800 Power supply. · New Best Enhanced 7800 Power supply has a longer 15 ft upgraded cable type compared to the stock made Atari 7800 Power supply 12 ft cable. We upgraded the 7800 power supply cable from the old thin twin molded / extruded together cable with its known failure cable modes (see 2 failed Atari 7800 Power supply pictures with bad / damaged cables above) to a newer upgraded larger round cable type that has two individual / separate coated / covered wire cords that are now covered / extruded together with a third outer cable housing / jacket which adds a great deal of extra strain relief factor to the New Best 7800 Power Supply cable. Best measured the stock Atari 7800 Power supply flat cable (again averaged over 5 different Atari Manufactures versions of the Atari 7800 power supply cables used) thickness and it was 1.61 mm thick. The New Best round thicker cable diameter measures 3.50 mm diameter. Top Best 7800 connector end is the 2nd Article sample Power Supply Best received. You can compare the bottom stock Atari 7800 Power Supply twin flat small cable to the Best 7800 Power Supply cable with its Upgraded thicker Round cable with its better strain relief properties. Also you can see the 2 Gold Plated Tube connectors thru the prototype translucent 7800 connector tip. · Assuming the basic inner copper wires are the same diameter for both the stock Atari 7800 power supply and the new Best 7800 power supply, the Best power supply has almost double the outer thickness insulating black plastic outer jacket on the round wire. This thicker outer cable insulation means better strain relief characteristics around the 7800 power supply connector back end and as the round wire goes into the Power supply body strain relief. This new larger cable with their larger improved strain reliefs on both ends will prevent the exposed copper wire problem that has plagued the stock made Atari 7800 power supplies for the last 25+ years. Although we discussed the problems with the old Atari 7800 power supply twin thin cable problems with our Power supply manufacture and they told us about the better round wire type that would eliminate the old 7800 power cables getting damaged. The 1st Article new sample power supply received on Oct. 12, 2017, had the stock Atari 7800 type of flat thin cable. As part of the 1st article items to be corrected report sent back to the Power Supply supplier, Best specified that the old 7800 twin lead cable type was to be replaced the upgraded thicker round cable type. This meant that the brand new just made 7800 custom mold for 7800 power supply upgraded connector body with its round tube connectors, had to be modified to accept the larger diameter upgraded round cable type. This also meant, that there was another month+ delay before the mold modifications could be completed. The good news for Best, this required new mold modification was done as a no extra charge cost to Best. This new round 3.50 mm thicker diameter 7800 Power supply cable has the Best Web site information silk-screened information along the cable length. 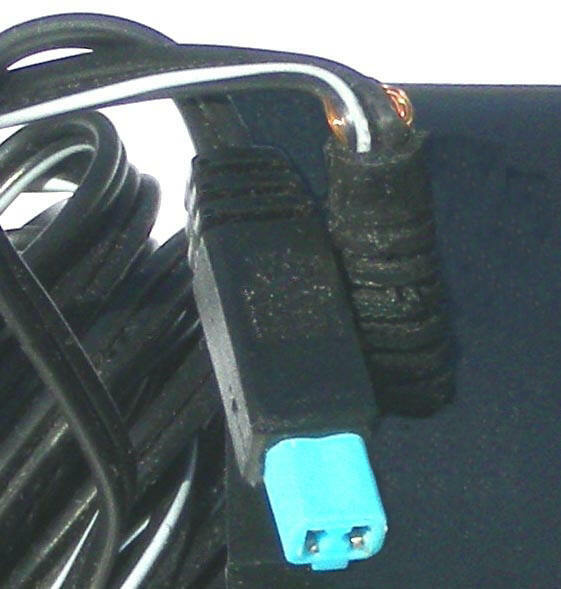 · A New feature we added to the just released Best Enhanced / Upgraded Atari 2nd gen. 8 bit Atari Composite Video cable, was so well liked by our Atari users, we have added the same permanently attached Velcro cable tie wrap to the new Best 7800 Power Supply cable. So if you have to adjust the 7800 Power supply cable length, instead of using a rubber band or try to find a loose black plastic cable twist tie, the Best 7800 Power supply has a permanently attached reusable black Velcro cable wrap. 2nd article Best 7800 Power supply with the new round cable with reworked Atari 7800 connector Strain Relief to accept the larger round diameter cable. Also this sample Power Supply has the permanently attached black Velcro cable wrap / tie. · The auto switching Power supplies run a lot cooler than the fixed voltage power supplies with their very large / heavy internal transformers, which is good for all of the internal electronic components used in the auto switching power supplies. This means an auto switching power supply will run years and years longer compared to a warm to hot running fixed voltage old power supply. · Best ran engineering temperature tests on the new Best 1st article 7800 auto switching power supply vs 5 different Atari manufactures versions of the fixed input voltage US 7800 OEM Power supplies. A thermocouple was attached / taped down on the outside of the black plastic case of each of the five different Atari OEM stock 7800 Power supplies. Each different power supply cord was plugged into a 7800 console with an Atari 2600/7800 game cartridge inserted and then was turned on for at least a couple of hours to let each stock Atari made 7800 Power supply case to heat up to a Maximum running internal temperature. After that time period, the outside of each 7800 Power supply case was checked and each different temperature was documented. For a fair comparison of all of the different Atari manufactures stock 7800 power supplies tested, Best averaged the 5 versions of the stock 7800 Power supplies different temperatures ranges into one average temperature to compare against the temperature of the outside case on the new 1st Article Best 7800 Power supply. These tests showed there was a 16 degree Fahrenheit difference between the stock Atari made 7800 Power supply cases vs the new cool running Best 7800 auto switching Power Supply case. In the real world, this means the stock Atari made 5 different manufactures of the US 7800 Power Supply cases all ran warm to very warm to the touch and the Best 7800 Auto Switching power supply outside case ran cool to a only slightly warm feel. These test results shows the old stock Atari internal 7800 power supply internal components are running much hotter inside the power supply case, which shortens their useable life expectancy. · Instead of putting the new auto switching Best 7800 power supplies in a smaller black power supply case (because of the smaller internal auto switching hardware / PCB board) Best went with a larger case style, closer to the same size of the original Atari 7800 Power supply case. This was done for two different reasons. It is easer to locate the new Best 7800 Power supply because it looks like the same size of the OEM Atari 7800 power supplies made. The larger new 7800 power supply black case and smaller / lighter (the auto switching power supplies do not use the very large and heavy step down internal transformers) auto switching internal components within the Best 7800 power supply will dissipate heat better because of the extra empty free air space inside the Power supply case which means those cooler internal switching power electronic components will run longer. · One of the final 1st article tests that was done on the new Best 7800 auto switching Power supply, was running the new 7800 switching power supply on a 7800 console at 110V for over 12, 24 and 48+ hours of continues use. The same 12, 24 and 48+ hour burn in test was also run at 220V input voltage continues use test too. The new Best 7800 auto switching power supply passed both extended hour tests without a single problem. · Because of the lighter shipping weight of the new boxed Best Atari 7800 Power supply, they are more cost effect to ship within the US and much most cost effective to ship out Internationally, where shipping costs are almost twice or three higher than the cost of US shipping. · The New auto switching Best Atari 7800 Power supply meets / passes the UL (US), cUL (Canadian UL), CE European Electrical Safety Standards and GS (German Safety Certification Mark) Electrical Standards. 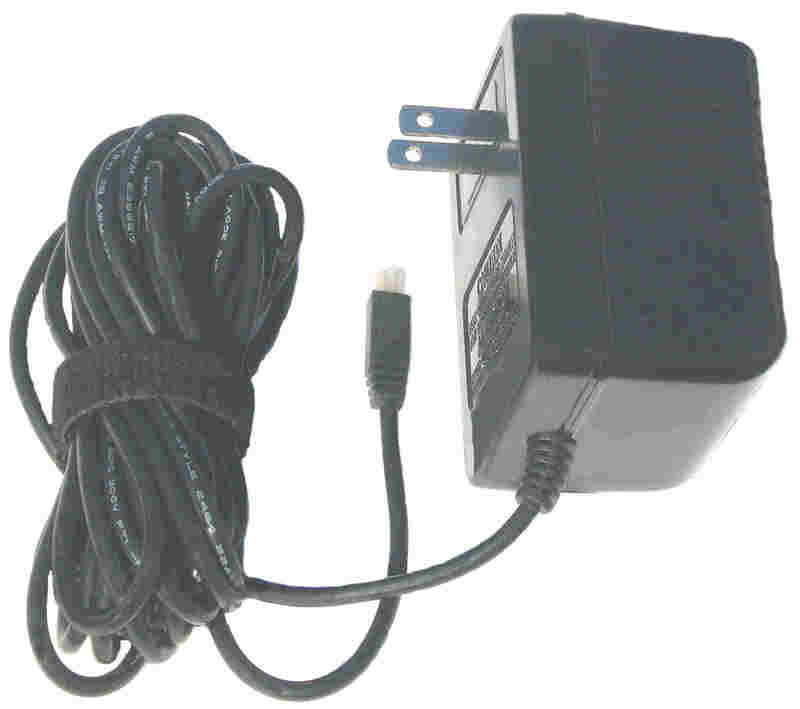 AtariGuide Atari 7800 Power Adapter Supply BRAND NEW **FREE SHIPPING** Seller does not offer returns Current 4 day E-bay auction as of 02-24-19. Buy it now for $34.99 with free shipping All Atari Clone and over priced Atari OEM 7800 Power Supplies listed on E-Bay, all suffer from the same problems that cause the always fail early for the last 25+ years. It is one of the many many reasons why current and new Atari 7800 console owners are always looking for a replacement 7800 Power supply! Bests New boxed Upgraded / Improved Atari 7800 auto switching Power Supply with normal 90 day Atari Warranty. 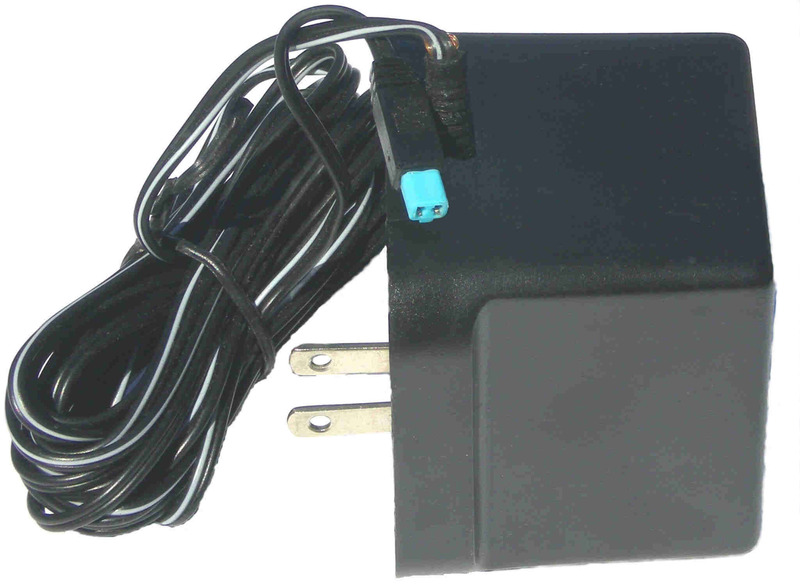 $21.00 plus Max US shipping $9.30 For more Information on the Best 7800 Power supply click on here. On November 24, 2017 Best sent a 2nd Article receiving report back to our Power Supply manufacture with some new items that needed to be corrected on the 2nd Article 7800 Power supply with the new upgraded round cable. After several more months of delays caused by our Power Supply manufacture trying to meet all our Best Engineering requirements on the final version of the new 7800 Power supply. They contacted us on March 15, 2018 with some new information and pictures of items that needed our final approval to preceded into full production run. Best told our Power Supply manufacture all of the new features and pictures they sent us were approved and they could go into the full production run of the New / Atari Upgraded / Enhanced Atari 7800 Power Supply. They said they could send a small preproduction quaintly of the New 7800 Power supplies by April 5, 2018.